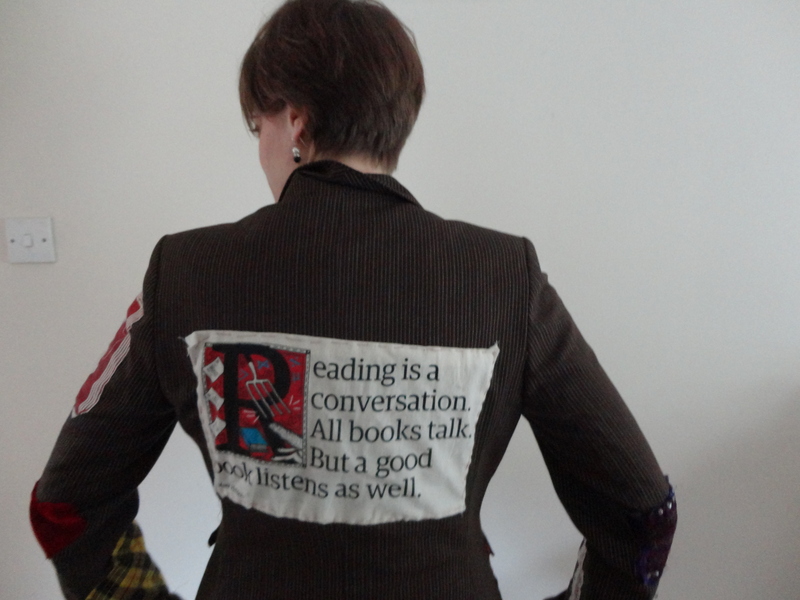 The back of the fabulous blazer, as modeled by the author. What started in 2009 as a project for my Writing for Electronic Media class has developed into a fully fledged and (mostly) regularly updating blog written by yours truly. The blog once focused primarily on writing and books, but has since evolved into something more along the lines of a ‘slice of life’ blog. This came about following my moving to Edinburgh, UK for my MSc in Design and Digital Media at the University of Edinburgh. I enjoy writing about my expat experiences. The things I write about include the good old books/writing, lindy hop, and the awesome-if-slightly-eclectic adventures my friends and I get into. Case in point, having strangers plan our dinner party. I’m also on Twitter, if you prefer smaller doses of this blog (shecontemplates). Though this is usually more art and music centric. I talk about minimalist techno there. Beware. I’m also on Pinterest (shecontemplates), which features mostly art and fashion. Nice to meet you! So, as I understand, you are future american animator. May I request some little help with English? Thanks for any reply in advance. I’m not sure if I’m going to be an animator–I have difficulty drawing the same style twice! I’d love to write scripts for movies or TV shows, though. It is not a big problem. What really matters that you can draw and like drawing. I think animators use some films, and patterns. I even don’t tell about software. I want to send you mail, and explain substance of my problem, but I don’t have your contacts. Despite big part of text is in Ukrainian, main idea must be clear. I want to translate book of Steven Levy. And in the bottom of article is letter for him. That letter I not send yet. And need comment from person who know English well, and know how to write such letters. P.S. Even don’t know what to give you in-exchange. May be only respect and friendship. Pingback: Another Friday Post: Even More Writer’s Blogs « Neither Here nor There…. Your dad suggested I look at your site. I am impressed. You certainly have come a long way since the little girl I knew. I look fordward to reading your stories and I am going to suggest my grandaughter read your site, with your permission of course. Keep up the good work, see you when you have your summer break. How’s everything going? I didn’t realize that you were co-authoring a WIP. I’m just starting one myself. I would love it if you could write a guest post for me about co-authoring a project when you have the time. What is this WIP about? Sure, I would love to! I could probably have the post sometime ready in late May or June. I’m graduating in mid-May, so life will be pretty busy up until then. I self-published a short horror story for free at the weekend and was wondering if you would be interested in reading it and posting a review of some kind about it. Sadly, I am a postgraduate student, so I don’t have time in my schedule for reading most books outside of my programme. Thank you for stopping by, though! Hope you come back soon.